Updated on 3rd December 2016. Udemy is currently the leading online learning platform. In 2015, their top 10 instructors made more than $17 million in total revenue. Find out how I make $4000+ each month by selling courses on Udemy here. How long will Udemy be with us? Hopefully a long time. But they’ve received over $170 million in funding in less than 6 years and have yet to turn a profit. Read on to find out where else to sell video courses on these Udemy alternatives. Udemy courses don’t have to be exclusive to Udemy so, once you have created the course, you are free to hawk it around to other online learning platforms, your own site as well as a plethora of other “deals sites”. This is passive income at it’s finest: make the product once and sell it again and again on various different platforms – through various different packages. Skillshare is a New York based online learning platform. Their main categories of learning are creative arts, design, entrepreneurship, lifestyle and technology. The Skillshare site is, unfortunately, not as robust as Udemy is or Skillfeed was. Their email notification system is broken which makes student interaction virtually impossible. It’s something Udemy would fix in days but Skillshare have allowed to persist for months. You need a certain number of students (25) on a course before they start paying you. Better to upload lots of short courses. However, it is worth persevering with – I make about $350/month there (see my income reports). For Adobe tuition, Phil Ebiner of VideoSchoolOnline, who regularly clocks more than $10,000/month on Udemy, also sees some money coming in from AdobeKnowHow. I’ve emailed AdobeKnowHow several times but they’ve not replied. This happened to Phil as well. Keep persisting with them, you never know, it may pay off. I’ve had some courses for a long time at Stone River Elearning and they’ve made some sales. The site owner, Mark Trago, is super helpful and did all the uploading from Dropbox for me. StackSkills is definitely worth a try. They sell bundles of courses but that’s great to get you in front of new audiences. I’ve been making thousands of dollars a month recently through bundles on StackSkills. And now they have started a new general course directory called Skillwise. I was approached by Amazing.com – the home of the Amazing Selling Machine, which is the foremost Amazon FBA course. They looked very promising at first but they ended up messing me around over uploading videos, not adding my courses, being rude to my VA and failing to respond to emails. They recently got rid of half of their staff. I would avoid this company at the moment but some instructors who got in early aren’t doing badly. At the moment I believe they’re only accepting courses on Amazon FBA. learning.ly (from the Economist) looks promising. I sent a few emails last year which they ignored. However, they have recently put up a simple application page where you can apply to become one of their “experts”. I did this and they got in touch soon after saying my application had been successful. Currently in the process of uploading videos. Watch this space. So far Curious.com has been disappointing. It’s a big site but I found their way of delivering courses restrictive and the small amount of videos I managed to upload didn’t get any interest. They do have a sizeable audience though and I have made $100 after 2 years! I haven’t even scratched the surface of online learning. 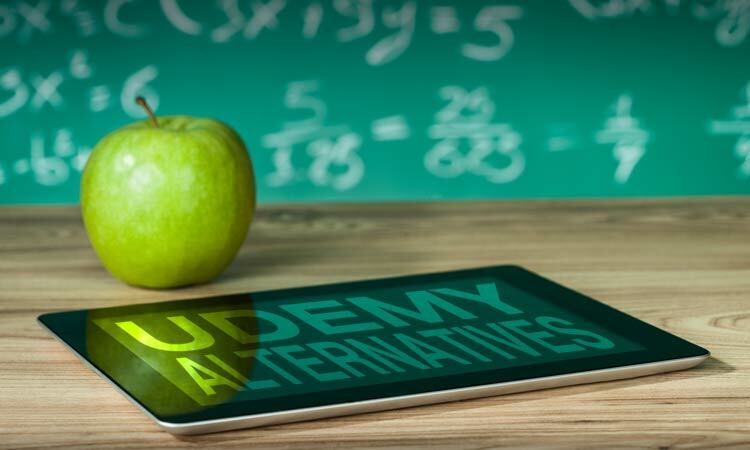 There are other big names like Khan Academy, Coursera, Lynda.com, InstaEDU and Treehouse – are credible Udemy alternatives but these aren’t right for independent course creators. Amazon Video Direct “launched” amid great instructor excitement around April 2016. There’s a lot of talk of the retail giant moving into education in a big way. But they clearly changed their minds! I would avoid AVD unless you create kid’s or entertaining content – education isn’t working on Amazon Video Direct! It’s difficult to see how this is going to play out. It’s difficult to get stuff up there and approved and then, when you do get material on the Amazon store, it’s largely viewed for free by Amazon Prime members so doesn’t make a lot of money. Sales of actual courses has been slow. Read here on how to sell video courses on Amazon Video Direct. Another new option available to us is the ability to sell or rent videos on the 3rd most visited website on the planet (after Google and Facebook). As I,ve said many times before, every video course creator should work hard on creating a great YouTube channel. You can make a bit of money there if you allow ads at the beginning, at the bottom or to the right of your videos. Putting content for sale there is very easy (just click the dollar sign in Video Manager and instead of monetizing with ads, check the “Require rental or purchase to view” box. You can then specify prices for certain countries and choose another video to act as a trailer for the one you,re selling. I uploaded a two-hour course and started charging for it. This doesn’t look like a big money earner either. Learnable is now redirecting to Sitepoint Premium – SitePoint is a brand I have a lot of affection for as I used their forum a lot when I was starting out, they are publishers of books, courses and articles for web developers. Here is the email I got from Learnable (so I don’t know which they are now, Learnable or Sitepoint Premium? ): Unlike some other e-learning sites, we are not a marketplace and we don’t usually offer 3rd party courses. We prefer to make our own, which are offered exclusively on our site. If you are interested in perhaps becoming an instructor, I can pass your info on to a colleague of mine, who can provide you with more information. So, nope! I’ve also uploaded one course at LearnSocial – unfortunately with no sales yet. PluralSight may be right for some people but as they insist on exclusivity of courses and 10 minute audition videos, it’s hard to see many existing Udemy instructors investing time with them. Edcast.com or Edcast.org – either way. I’ve had my courses there for a while. Waste of time so far. Coursmos claim to have 1.8 million users. Their Moz domain authority is worse than mine so I doubt this. OpenSesame low traffic site, probably not worth it. fr.tuto.com – French online learning platform is moving into the English language online learning space. One to watch maybe. Skillfeed was a subscription-based online learning platform run by Shutterstock. Rather than one-off course enrolments, it was subscription only and you got paid per minute viewed. Skillfeed is no more. They shut down on September 30th 2015, presumably because they weren’t making enough money. You can see from my income reports that I used to make around $400 a month from Skillfeed which was totally passive income. I had my courses on Bizsnack. Why, I don’t know. Bizsnack shut down in 2014. They couldn,t get it going successfully. The site has been offline for a long time. This shows you that there’s a potential to waste time with these sites. Putting courses on their site is a time-consuming process and I’m yet to hear of any of these course platform apologise for the time they’ve wasted. This possibly shows you that only the very big boys are going to succeed in this market. But, we just don’t know for now. Be wary of low quality, low traffic Udemy alternatives. They will waste your time and will steal your money. Avoid Easyskillz, they have sold 20 of my courses and not paid me a penny yet. Avoid Edurila at all cost. They were selling my courses on Stackskills for months without my permission – extremely dishonest! Where I’ve tried and failed: ThinkVidya, WizIQ and 360Training – avoid these, a waste of time. Coggno is reputably a waste of time as well. To guard yourself against the dishonest and doomed to fail sites you should check their Alexa Rank, Moz Domain Authority or just about any other ranking factor you think of. You can guarantee that Udemy will win out over all the other sites in these ranking factors so there is a tale to tell here. However, bear in mind, the online learning space is incredibly dynamic. A Google, an Apple or a Microsoft could move in and really shake things up. Similarly a smaller player with a good idea could appear from nowhere and trounce the competition. We just don’t know. You can also sell your courses (and e-books) through different “deals sites” where courses are bundled together with other courses, software, e-books, etc., and sold. There are thousands of sites like Groupon (retail) and Appsumo (software) and you have potential to reach a wider audience and make more money here. The two I’ve had the most success with are: DealFuel and StackSocial – both of them cater to the web design market. There is also MightyDeals. Again, we are only scratching the surface. There is huge potential for joint ventures with not only “deals” sites but other sites as well and bundling your course with other products or services. It is limited only by your imagination. Selling courses on Udemy alternatives is easy but it’s turbulent and you never know what’s going to happen. For example, I was making about $400 a month without any effort on Skillfeed for over a year and, after September 2015, that disappeared. In the above video I talk about the Skillfeed’s shutdown, online learning platforms and deals sites. Firstly, make every video stand up on its own so it can be repurposed onto another platform. So don’t mention Udemy, don’t mention the course’s name in the videos. Don’t number the videos if you want to use other Udemy alternatives. Brand them with your own brand. This makes it easy to use the same videos in multiple courses as well. Secondly, save all the course’s video files (MP4s or MOVs) and downloadable materials (PDFs, DOCs, etc.) in one folder on Dropbox. This means you can upload direct from Dropbox (useful for Vimeo and Skillfeed) and makes it easy to share with a VA or another site. Thirdly, get LastPass or some sort of secure password sharing service and hire a VA to do this time-consuming and tedious task. And, finally, don’t forget the most important site to sell your courses on – you own site. Remember, selling content on Udemy, Skillfeed or other Udemy alternatives is great but these are other people’s platforms. They can do what they want with their platform. They can change the commission structure to pay you less money or even kick you off. That’s unlikely, but let’s spread our risk. The least risky platform is your own website: Your site with your email list and your buyers list where you sell your products and pocket most of your profit. This may be the hardest place to sell your courses but you must try. The easiest way is with a solution like Teachable, Patience.io or Thinkific. Fedora is especially easy as you can create your courses within a few seconds as you can upload direct from Udemy. The hard way is to set up a WordPress membership site plug-in with video storage. There is a baffling array of WordPress membership site plug-ins. A very popular and easy to use membership plugin is WishList Member. I have a free course Create a Membership Site with WishList Member and WordPress which shows you how you can use WishList to charge for online content. However, I thought I’d try out MemberMouse for my membership site as they’d received a number of positive reviews but I was disappointed with their support and documentation. So I migrated to Digital Access Pass (DAP) which offers greater functionality than most of these plug-ins. There are many more, for example: MemberPress, S2Member, WP-Member, Restrict Content Pro and eMember. For the video storage and delivery, you can use Amazon S3, Wistia or Vimeo Pro. There are many membership site solutions all offering differing features and the likelihood of you knowing which features you’re going to want in the beginning is very small. So just choose one and go for it – you can migrate between membership plug-ins so don’t let analysis paralysis get in the way of you selling stuff online. You can create a video course and sell it on Udemy, Skillshare, your site, other online learning Udemy alternatives sites and other “deals sites”. It’s important to keep an open mind as some sites look like terrible places to sell your stuff one day and end up earning you thousands of dollars a few months later. And, don’t forget to always sell from your own site. I used DAP for a membership site a couple of years ago. Like you, I was attracted by the greater functionality that it offered compared to it’s rivals. There are a few things that eventually really put me off it, and one showstopper that made me eventually dump DAP in favour of an alternative. While DAP works with WordPress, it doesn’t really feel like a true standalone WordPress product. it operates quite happily outside of the WP environment, and it really fells like the WP aspect is bolted on at times. It was a lot more tricky to get up and running than I expected, but once I had it going it worked well, and using it with Optimizepress was easy. The real showstopper for me though was when I wanted to migrate from a .co.uk domain to a .com. it was then I found out that DAP uses quite a bit of encryption to protect itself from being pirated even though I had a license to use it on more than one site copying the site from one domain to another and getting DAP to work was impossible. DAP support informed me that it wasn’t meant to do that and were unable to help. I’d like to think that anyone that is serious about their web site does testing outside of the live environment. A product that prevents me from doing that is no good to me. I’ve switched to s2member pro. It does everything I need (and I’m moving one of my Udemy courses to sell from my own domain with s2member pro) and the cost is low, particularly if you shop around for a coupon. DAP has some great features, but if you are thinking of using it, be aware that it isn’t without it’s problems. Wow, Chris. Thank you. Really great to hear from someone who has been there, seen it, done it with membership sites. I was nervous about the way DAP isn’t created solely as a WordPress plugin. I won’t want to migrate the site but that’s an example that you never really know what you are going to want to do in the future. I actually decided to outsource the migration process to someone who has done this before. Lazy, I know. This is an epic guide for all the places one should post to. For everyone out there, I completely agree with what Rob says. I’ve had most of my success on Udemy. But Skillfeed & Skillshare actually tend to be more stable (even though it’s less $$). Best of luck to everyone out there teaching online! Thanks for your comment, Phil. And thanks for your help in compiling this article. Awesome and thoughtful article! Thanks for the advice regarding the place to sell course. Now I clearly got where I should spend time to expand my horizons and where I should not. This is an excellent article. I’m at the point where I’m letting the analysis paralysis get me – Been teaching classroom courses for over 15 years now and online Live courses through Citrix for the last 5. Over the years I have a large number of recordings that are being edited. This kind of extensive research (and experiential to boot) is invaluable. Hey Paul, so glad you found this article useful. thank you for the comment. It really is a pity that businesses are allowed to operate in this manner. We at Nuvola Academy (NuvolaAcademy.com) want to flip the education landscape on its head. We don’t have any upfront costs, a clean 70/30 revenue share, a free portal for you to brand yourself, and the option to license your content to other instructors or businesses. We also work to create partnerships with business to provide to you as a value-add service. Our REST API and integration with Zapier is something to consider for an enterprise solution. But our purpose; our mission that’s the important part right? We want to make learning an enjoyable process for all parties; both the student and teacher. The majority of e-learning platforms are built with one party in mind or the other. We believe we are able to balance the two, often, contrasting needs and wants. Is it crazy to believe that we can do it where many have struggled? Sure, but would we be a startup if we didn’t give it a go? Disclaimer: I work at Nuvola Academy. Hello Cameron. “It really is a pity that businesses are allowed to operate in this manner” – which businesses are you talking about and what are they doing that’s a pity? Best of luck with your startup. Very informative article, it opened my eyes to the possibilities out there, and only made me more motivated! I had no idea you could sell your courses everywhere outside of Udemy at the same time, that’s awesome! I’m currently working full-time on a huge web design related course, and I was contemplating whether I was going to sell it on Udemy, or just release it for free on YouTube and hope to earn from their monetization system over time. Question – let’s say that my course doesn’t become as successful as I hoped for – I fear that my lack of self-promotion skills will hold me back, not the quality of my tutorials – would anything stop me from just uploading it on YouTube for free then, like 6 months later? I’m thinking that it becomes kind of “tricky” when you’re selling something on a paid service, but then release it for free on i.e. YouTube, but I’m not sure if I could run into any legal issues there? I guess it’s my choice if I want to release it for free at a later time, or? Thank you, David, I’m glad this has got you motivated, although I’d have to say that Udemy is the best in terms of earning – at least for me! Yes, you are fine to release something for free after it’s been paid for and then put it on YouTube. But I wouldn’t do this. You may as well put 20-30% of the course on YouTube as a teaser. The money you make on YouTube is really negligible, so you’ll definitely make more money if you put it on Udemy, Skillfeed and Skillshare. Also, does it have to be a huge course? Can’t you split it up into many different courses 2-3 hours each? That’ll make you more money on Udemy. Youtube. I didn’t even think of using some of the course as a teaser, good idea! Does it have to be a huge course? I suppose not.. my thoughts were that the more “complete” the course feels, the more attractive. My course takes you from a complete beginner to intermediate / semi-advanced, and it involves building several whole projects. Most of the lessons are connected to each other, it’s not just project a) and then project b) is something completely unrelated. I don’t want people to feel that the course is incomplete. My inspiration is Rob Percival who released a gigantic 29 hour course which has been extremely successful, and I think part of that is that he covers so many bases. Is it generally easier / more sustainable to make a good income by releasing 4-5 small courses priced at $25-$50 rather than a big one at $200? My plan was to (after the big course release) sell “addon” courses that take you to the next level, e.g. going from CSS intermediate to advanced (SASS / Less, pre-processors). I find these decisions far more difficult than making the actual tutorials â€” I put my heart into making high quality content, so obviously I don’t want to leave money on the table. You seem to know what you’re talking about, so I’m taking your advice seriously. There’s a lot of noise, but very little true value in this industry! Hi David, it might be a good idea to talk to Rob Percival about this. I know there have been a few examples of these really big courses doing well but I think these were done a while ago and by establish instructors. Are you established? My article How To Make Money On Udemy suggests it might be better to sell small courses of 2-3 hours at $99. I talk about Udemy’s discounting practices as well and there I say that most courses are sold at $10-20 so that’s what I advise, however, it is a bit different for you as it sounds as though you’ve created a really huge course already. Thank you for your kind words about my content. Let me know how you get on. could you shed some more light on the adobeknowhow.com platform? It looks interesting. Hi David, My friend, Phil Ebiner, told me that he had to email Adobe KnowHow a few times before he heard back from them and is now making money there with his Udemy courses. That’s all I know. Robb, have you had any success with selling your courses on groupon? I was thinking about it, but I don’t know if it’s worth the effort. Also, what would the course delivery look like? I mean, is the buyer provided by a link to a course I uploaded to google drive or dropbox? David, I’ve not had any success from Groupon. They’re just worth a try. That’s all I’m saying. I hope this helps. Let me know if you have any questions. Hi Rob, I’m new to all this, and want to offer courses for teachers. I’m getting analysis paralysis, but am thinking it might be good to put all courses on Udemy as a promotional tool mostly, but start building them seriously in Thinkific (where you own your data and can manage it). Would this be a wise way yo go? Yes, I’d put short (2 hour) courses on Udemy as quickly as possible. And put out longer, exclusive courses on your site (with Thinkific or whatever). Udemy is easiest but you have to put a bit of work in there to start the ball rolling. It helps to have an audience. 🙂 I hope this helps. Let me know if you have any questions. You are THE MAN. This was an awesome guideline! Thank you, Arthur. Glad it helped. I shorten this for sharing in LinkedIn and Twitter. Thank you for your advice, Alexander. Am a retired dentist (66) wanting to offer a guide for the dental consumer. I started on Udemy but found it difficult to navigate and support poor (not even returning email questions). So I switched to Siminars (because of good reviews), only to find out it is not a reservoir site of courses like Udemy. Not being computer marketing whiz I’m really at a loss as to which direction to go. Obviously my course is for the health consumer, not “students'” in the typical sense. I don’t have an email list or database already in place. Should I just create my own website first and then worry about these elearning platforms later. If so, can you suggest a webdesign co. (e.g. ipage or other)? Seems like Udemy is the leader so perhaps I should just try to muddle through it. Some direction would be kindly appreciated. In closing, I might add that I’m a former academic as well-I know how to write content, I’m just lost in this new age of internet marketing. Hello John, thank you for your message. My advice to you would definitely be to persevere with Udemy. If you find Udemy hard to navigate you’ll struggle even more with the other options available. I don’t find the support poor at all. There are times when they don’t answer emails but all you’ve got to do is send the email again, tell them you’ve been waiting a few days and they’ll get back to you asap. In your case, I would do Udemy first, then your site (using WordPress) with an email list, maybe choosing Teachable to sell the courses on your site. But definitely first things first. I struggle with “internet marketing” now and I’ve been doing it 10 years. You’re not going to learn this stuff overnight. Fantastic information here Rob. Well done! Been months trying to find this kind of honest and non-biased detail. 2. I was going to purchase an LMS (WPLMS or Teachable) but after reading this I am thinking I might be wiser to build up a few courses on Udemy first before investing all that money in having my own platform? 3. I noticed in a previous comment you made above that you recommended A)UDEMY B) OWN SITE C) TEACHABLE. I am curous what purpose the website would have in step 2 when you dont have your videos on it? You would market your course there and build a mailing list? 4. Can you mention your own websites in a udemy video and provide a link to it. Hi Brendan, yes, this post does quite well on Google so I’m trying to make it into a real resource for people trying to find places to sell their courses in. 1. No, disagree. It has quizzes and discussions and they do quite well with that in my experience. 2. It’s up to you. The good news is you can do both. I did Udemy first because it’s easier. But everyone’s different. 3. I’ve just edited that comment so it makes more sense now. (oops!) What I meant was sell the courses on Udemy first and your site second (you may want to use Teachable you may not). But, as I say, it depends on the individual. I would say that it’s crucial that you at some point soon if you haven’t already start a site and start collecting email addresses as that is a good investment for the future. Hope this makes sense now. 4. You can in the last “Bonus Video” and you can refer to your own website in the course of the course I “brand” all my videos with my name “Rob Cubbon” which people can google and come here. Many do. Thanks for clarifying this. Yes, I agree with your points. I think it also makes sense to have a nice bit of tried and trusted material ready to upload before transferring to your own website as it is quite costly to do this. Can you send me a link to your own website to have a nose? Brendan – it certainly doesn’t have to be costly to use your own website for your courses if you host the video content on Amazon S3. Depending on how many videos you have and how much they are being viewed you could be paying less than a dollar a month. For a course I streamed from there about 3 years ago I only ever paid around $1 per month. I’m in the process of setting up my site to sell my courses from there as well as Udemy, and you can’t beat S3 for the combination of price, speed and reliability. And (I think they are still doing this) they give you the first year free. Besides, if you try and host and stream videos from your own web hosting I’d be surprised if your web host didn’t have something to say about that (assuming you are using shared hosting). I’ve spent the day looking at Amazon S3 and it looks great, My only concern is how difficult it might be to embed it into my website. Would you just use a separate membership plug and other plug ins to mimic UDEMY or teachable? I’m concerned that this might be a lot of work for someone who is not tech savvy. I do apologise for all the questions. Brendan – you don’t have to copy everything that Udemy or Teachable do. It’s your own site, do things any way you want. Having said that, Udemy put a huge amount of time and effort into split testing things, so they are a good guide as to how things should be set up. But I wouldn’t get hung up on replicating everything. I haven’t. I’ve spent a LOT of time checking out various plugins and I’m using a plugin to manage the course building side of things, as well as a membership plugin to control and sell access to content. There are a lot of other plugins I’m using as well as those, because once you start building the site you realise that there are lots of other bits you need to add. For example, certain things you only want members to see, other things that you just want non-members to see etc. (eg. I don’t want to show messages encouraging someone to sign up if they already have!). As for S3, it’s reasonably straightforward once you grasp Amazon’s slightly weird terminology (buckets etc,). Securing the files is the bit most people get wrong, but if you do this in conjunction with a plugin then it’s pretty easy. If you are doing things from scratch and haven’t done this before then yes, it will probably be a lot of time and effort. The biggest headache is trying to work out all the pieces of the puzzle and how (or if) they fit together. I haven’t done any custom coding on my site, it’s just readily available plugins that I’ve used. The nearest I got to coding was the conditional logic for displaying widgets, and that’s just another free plugin. Doing it yourself is by far the cheapest way in the long run as all you will be paying for on a monthly basis is your hosting and Amazon storage. My hosting is $13.42 / qtr and my Amazon S3 is costing me nothing, and I can host as many courses as I want. I’m going to put something together on how I’ve built everything, so Brendan, if you want free access to that then contact me and I’ll let you have that when it’s finished, It should answer a lot of your questions. BTW – I’m in the process of switching hosting, so my site may be down for an hour or so. Thanks for your help and amazing advice for Brendan, Chris. I really appreciate the time you put into this. Yes, Amazon S3 is awesome value and is a great long-term storage option. But, lazy old me, I couldn’t be bothered to work it out and paid the extra money to Vimeo Pro! Combining the courseware plugin with the membership plugin I found to be the hardest thing but I choose Sensei as my courseware plugin which is particularly hard to integrate with anything (apart from Woo plugins, presumably). Setting up a video selling / membership site is a real tough ask, as you say, there are a lot of jigsaw pieces to put together and anyone who does it well has my admiration. I thought I messaged you but didn’t. Apologies for delay particularly when you gave me so much food for thought. I would love to see your site and learn more from you. Please keep in touch and share with us. Sounds like an interesting project! Initially i wanted to start my course using udemy. But, even if i keep my course for pricing, there are asking the to add the paypal account. As this is the first time im trying to upload to udemy. I am not sure, if they deduct inital amount from Account, which doesnt have single penny. Do you have any inputs on this? Hello Praveen, no, Udemy will not deduct anything from you if you sell courses on Udemy. They will only take money from your account if you buy another instructors’ course. I hope this helps. Let me know if you have any questions. I’m using screenflow to make my video course which I find really great. I want to add a few nice touches when editing to break up having a face shot of me and some boring power point slides. I need some magic to make it engaging and fun. Anyone know anywhere I can download Ppoint templates with good transitions or at least point me in the right direction with regard to sprucing up my learner videos. I don’t mind paying for advice or ready made templates. For example, if I wanted to get students to learn something that was a little aside from the main topic of the lesson I would have some background music with a particular background or introduction? Does this make sense? I never bother too much with slide transitions, Brendan, but I do hire an editor that spruces up the videos with animations, highlighting, zooming, etc. I wouldn’t put music. But an intro and outro with sound done in AfterEffects is a good idea. I do that with my Rob Cubbon logo and that increases my brand’s recognition. And, yes, make the slides themselves as attractive as possible. I don’t know of any Powerpoint templates but you could maybe hire a designer to help you. I really wanted to like DAP, however… (1) DAP;s learning curve is steep, and it’s difficult and time consuming to setup membership sites. That said, DAP does have lots of features. I paid the big money for the most deluxe version of DAP including the concierge service, training over the phone (via GoToWebinar for 1-on-1) and still I find it extremely difficult to use. Other membership plugins are simple, some even have drag-and-drop setup of complete sales funnels. One plugin has a video where you look over the owner’s shoulder as he sets up a complete membership site in under 2 minutes. (2) Support isn’t all that great. I had two instances where the owner and his wife (who work from home btw) were rude and pushed the issue back on me without resolution, and in both cases I had to hire outside tech person to help me determine (and prove to DAP) that the issues were indeed DAP bugs as I had thought. In the end, to protect my financial and time investment in DAP, I learned to navigate around the “tude” of the owner. (3) Eventually I jumped ship, like many others on the marketing forums have said they’ve done. Went to different membership plugins. Now I can spend my time on the content development, and the marketing, instead of on the technical side. (4) You gotta pay DAP’s yearly support fee in order to get product updates. (including updates with security patches) and that fee is hundreds of dollars, almost the original price of DAP, therefore you are buying and re-buying the product year after year. (5) Finally, if you don’t mind the high cost, and you’re a techno star who can whiz past any difficult setup stuff (which is constantly required to maintain your membership site) and you have lots and lots (and lots!) of free time to spend on the setup and continuous maintenance (things which other membership sites have automated, e.g. drag-n-drop sales funnel setup as I mentioned above) then DAP may be perfect for you. It’s very feature rich. To be honest, Patty, some of what you said rings true for my experience with DAP. I have never found Veena and Ravi rude but it does worry me that they seem to do everything themselves including the support – what happens if one of them got sick? However, your experience with DAP was the same as my experience with WishList Member and MemberMouse. Yes, I’ve moved membership plugins three times and I don’t want to do it again. My biggest issue with Udemy is that they don’t protect their instructors’ video content. Hulu protects their video (via advanced RTMP protocols) making it virtually impossible to download. Yet Udemy, who is a pretty big operation (out of 4 million websites ranked, Udemy is among the top 500 trafficked sites in the world, as ranked by Alexa) yet Udemy doesn’t bother to implement RTMP to secure the videos of their instructors. Anyone know why? Udemy does indeed offer to send out DMCA takedown notices to content thieves (kinda useless though once content reaches blackhat sites and then hundreds of mirror sites) but why not just setup a more secure environment in the first place? Plagiarism on Udemy is such a major concern, that one of Udemy’s top instructors, Alun Hill, has a “how to sell on Udemy” course with an entire lesson dedicated to navigating the issue of plagiarism of Udemy content. Alun explains that within days of releasing a new course on Udemy, it WILL show up on the black hat websites–and his solution is simply to “dumb down” your course content in the beginning (leave out the good stuff! ), then AFTER your course has been stolen and appears on the black hat sites and mirrors, you may then re-add the better/premium course content that you held back. Alun claims that once something has been added to black hat sites, it’s rare they would replace it with a more recent version. Rob, can you recommend a marketplace-based solution such as Udemy, that attempts to protect their instructors’ content? There isn’t a single video that you could put up on the internet that I couldn’t copy, and I don’t care if it is RTMP or not. I’m am 100% NOT a pirate. It’s just that is a fact of life. If it shows on a screen it can be copied. That is the reality. So if you don’t want your content to ever be copied then the answer is simple – never publish anything. BTW – I’m a Udemy instructor and have had my content stolen and uploaded on torrent sites within 24 hours of publishing it on Udemy. I’m also an author who has had downloads in the hundreds of thousands of copies of my book from torrent sites, yet sold hardly any. Am I bothered? Yes and no. It hurts when I see it happen. It doesn’t put me off from publishing more content on Udemy (or Amazon) but the reality is, these people were never going to buy my stuff anyway. They were never my audience and I probably have never lost any money as a result. Look at TV stuff like Breaking Bad. They say that would have been cancelled after season 1 had it not been for the piracy showing it was really popular. You might as well face up to the reality of what is happening and embrace it. Rob publishes great content. I’m a big fan of his, and if I’m getting my content stolen then I’m absolutely sure he gets his content ripped off on a regular basis as well. You are thinking in terms of a limited market. There are plenty people willing to pay for what you have to offer, if it’s good content. BTW – I also had issues with DAP and jumped ship (and glad to be out!). Patty, I agree with Chris. Yes, my courses have all been ripped off. Do I care? Not really, to be honest. I’m not familiar with RTMP protocols but if you can see the latest Hollywood movie or install expenses software for free within minutes of it being produced then our courses are always going to fall victim to the torrent sites. Again, I think Chris is right. And, he’s right as well, the people who download the torrents would never buy any way. The people who buy through Udemy or my own site prefer to consume the content properly with support, and, they know they’ll get a question answered by me if they get stuck. Chris, appreciate your comment that pirating of y0ur courses do not affect your sales, cuz those people aren’t buyers anyways. With all due respect, that argument has been repeatedly debated on marketing forums, and the consensus among marketers is that pirating does indeed affect sales. Let’s say someone is thinking about purchasing your regular course. So they type your course name (within double quotes) into Google, and not surprisingly the top search result is the link to your course on Udemy. But… search results #2, #3, #4 are links to blackhat and torrent sites where your course can be obtained for free. Keep in mind that a majority of people who are course buyers will also go for a pirated freebie if they see one. I agree Chris that you are probably capable of copying most any online video. However that is like saying “You don’t need to lock your door because there people who know how to pick locks”… but the reality is that locking your door keeps out 99% of the thieves. And likewise, protecting your videos can keep out **most** of the pirates. Very few people can download (requires knowledge of using sourcecode, github, entering your PC’s command line edit and installing a linux based tool, and going thru several complex steps) (rtmp vids can also be downloaded by purchasing software specifically made for downloading rtmp) Fyi nowadays rtmp video hosting can be done cheaply, at hosts such as onyxservers. These include vids served by Hulu. Virtually no one can downloaded these. When you purchase software specifically made for downloading rtmp vids, and attempt to download Hulu tv shows, you wind up with a video file that contains only the tv commercials. Any video can be pirated by making a Camtasia screencam movie of your computer’s screen, which btw can also be used to copy content from Hulu. However that video is super low quality, low frame rate, dropped frames etc. With all that being said (whew!) I still strongly believe that UDEMY SHOULD SERVE INSTRUCTOR VIDEOS OVER RTMP. An advanced protocol of rtmp, similar to what Hulu is doing. Downloading such videos requires a great deal of technical knowledge and the process is time consuming–so I doubt many blackhat losers would even bother. And finally, keep in mind that most of the people who steal content to place on blackhat sites are loser teenagers who do it for the online "street cred" …and the majority of them are "script kiddies" (google that!) rather than technically knowledgable people. Great article Rob! Thanks for all the thought put into it and for keeping it current! “You need a certain number of students (25-100) on a course before they start paying you. ” Do you think these online educational sites can cheat on the number of students? I don’t know, Audrey. But I wouldn’t worry about it. We are just setting up a new platform for selling courses called LURNMI. We specialise in accredited and certificated courses so are ideal for organisations with small cohorts looking for full LMS functionality (assessment, certification, gamification, social learning etc) without having to pay the usual LMS set up/minimum monthly fees. It works on a no set up or monthly fee basis, and you only pay a percentage of what you sell. We can also advise you on learning design and build you courses for you (and for early adopters we will do this for FREE). It’s a zero risk option for small organisations who are just starting out, or those who are looking to get their courses on to multiple platforms. Hi Phil, good luck with this. Thank you for letting us know about it.